The Silo District at the Lost Pines Art Center in Bastrop, Texas, features four fully renovated silos that will serve as art studios for various mediums. The glassworks silo, the first of four, is now open! The rest of the silos will be open soon. Be sure to check back for updates. 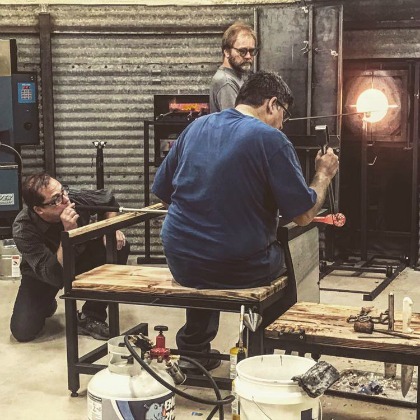 The Glassworks Silo at the Lost Pines Art Center is a fully functional glass blowing facility that features a 200 lb electric glass melting furnace, 12” and 18” reheating furnaces, and two annealing ovens measuring 24” tall, 24” deep, and 36” wide. There are also two pipe warmers, a pipe chiller, and two benches with a complete compliment of hand tools so that two teams can work at the same time. 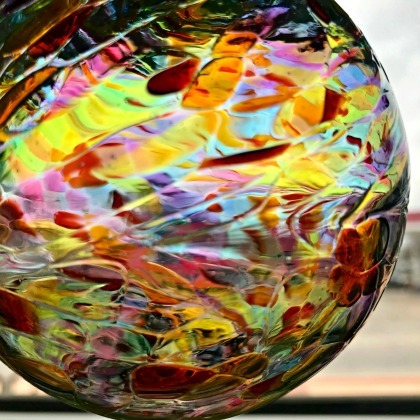 Experience the thrill of using your own breath to blow a one of kind sun catcher ball or glass flower! Sign up for an individual, one-on-one 20 minute session in our new Glassworks Silo with artist Mark Rendulic. All supplies are provided, ages 17 and up. 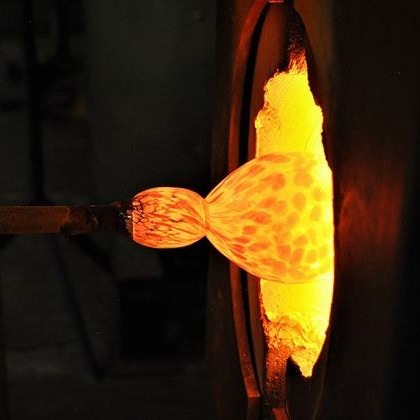 Learn the art of glass blowing, including how to use all of the tools in the shop to make a variety of pieces of glasswork to take home. Taught by artist Mark Rendulic, students will also learn shop etiquette and how to be a good assistant. All supplies are included, ages 17 and up. Are you ready to venture off on your own? With permission of our staff, you can rent this amazing facility and take your passion wherever it leads you. Please email art@lostpinesartcenter.org for more information. I along with my mom and husband attended a glass blowing/glass pulling flower making event at Lost Pines Art Center and it was simply amazing. Mark, the instructor went through step by step on the process of making a glass flower. We were a little nervous at first, but Mark made us feel like we could conquer the world. My mom who is 76 enjoyed making her flower so so much. I knew it was going to be an experience, just had no idea of the happiness this event would bring to our day… the flowers we made are one of kind, beautiful, amazing stunning pieces that we now display in our homes.. I loved this event and look forward to doing it again very soon. What could be better than a entire bouquet of glass flowers.. lol. Thank you Mark and thank you Lost Pines Art Center for making this possible.. truly was an amazing experience. Information about the other three silos will be coming soon! If you are an artist with a focus on ceramics and pottery, sculpture, torch work, welding, or other art mediums that require specialized equipment and would be interested in collaborating on the plans for our other silos, please send a letter of interest to art@lostpinesartcenter.org.